Hello! 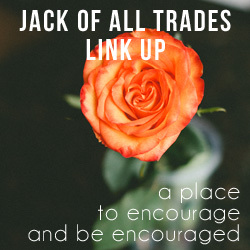 Today I'm happy to be co-hosting Jack of all Trades Linkup with Chantel! If you are new here, welcome! I hope you'll leave a comment and say hi so I can get to know you. 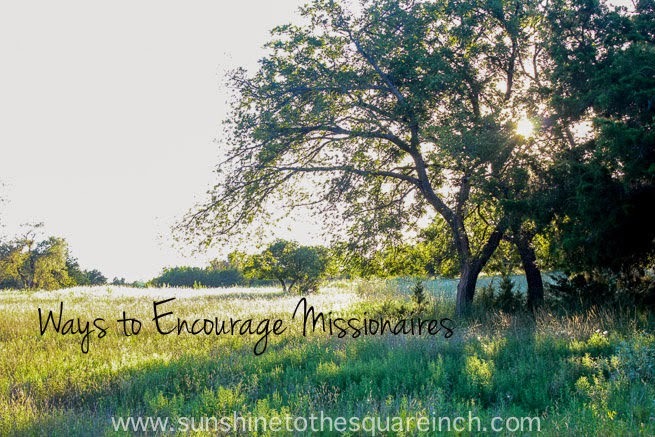 Today I want to share about practical ways to encourage missionaries or those in ministry. This past year I’ve made a point to more frequently interact with those serving in various places and the more I’m in contact with them the more I want to find ways to encourage them. Raising a family, sharing the gospel, and living for Christ is hard in America but throw in a new culture and no family around and you have a whole new ball game. Today, I hope that what is written will encourage you to take action to be an encourager. Prayer –Pray for those on the mission field! They need it and God hears and He does answer. If you aren’t sure what exactly to pray for usually their prayer card will give you some general guidelines or you could e-mail and ask them what to pray for. I also recommend writing down a specific day to pray for missionaries. Dave and I pray for missionaries on Mondays. I have more written about that HERE. Tell them you pray for them. Ask them how they are doing, ask them about life, etc. Tell them about your life. I think sometimes we as Christians feel bad about talking about life in America but trust me, people over seas want to hear about things going on. If you live in the same town that they did tell them of any fun changes: new restaurants, buildings, etc. Tell them how your family, job, life, etc. is. Tell them what God is teaching you. Cards - Send a card! If you go to the post office you can buy ‘forever international stamps. They are $1.05 each and will send to just about anywhere. A handwritten card when you are overseas is like Christmas! Care Packages – Send a care package. They can get expensive but you could get together with a few friends to gather items and ship them. Another thing is to get items that will ship in a flat rate envelope as that can help cut down on shipping costs. I’d also e-mail the missionary and tell them you are going to send them a package and ask what they want. Encourage the Kids – I grew up as an missionary kid and that had a big impact on me as an adult. Whenever I hear missionaries speak I always wonder what the kids think about everything. If you get a chance get to know the kids and send them some fun items. I know one time me and my siblings got a list of items some missionary kids wanted and let me tell you it was one of the best feelings to give those gifts to them. Those are my ideas: what are yours? Do you have anything to add to this list?Do you know of any missionaries that could use some encouragement? If you don’t know any missionaries and would like to get to know one I have a list of awesome people I could pass on to you. This link up is a place where we as bloggers can find new blogs to read, to be able to give encouragement to others and also be encouraged. Link up to one of your blog posts (not your blog homepage), the post can be on any subject but I do ask that posts are family friendly, any posts linked with inappropriate content will be deleted. Since the purpose of this link up is to get to know other bloggers and create a community you must leave encouraging comments on at least THREE other blogs, the one that is linked up before yours and at least two other ones. Link back to this post so we can grow this blogging community, you can use the button below if you like (your post will have to have a link back to A Harvest of Blessing in order for it to work). Awesome post! My school used to have missionary support nights, and I'm still friends with one of the missionary kids I met that way. I just found your blog today - I am looking forward to spending some quality time with it after work later! Those support nights sound really fun! Where is your friend a missionary to? Is she still serving abroad? I'm so glad you stopped by my blog. I love meeting new people! Not anymore, but he was in Brazil! It's always so inspiring to meet people who are living such an amazing lifestyle. I've always wanted to work in missions, but wasn't positive that I was called to do it. Then awhile ago, the guy I was dating (now my husband) told me that he wanted to teach abroad in Spanish speaking countries, after gaining teaching experience here at home. Now I know it's what God wants for us! Brazil!!! That's where I grew up! I was there until I was 9. I think that is really exciting that you want to teach in a Spanish speaking country! I love Spanish. Also, I think missions starts at home. Sometimes I think it is easier to 'go to the mission field' rather than share about Christ at home. Maybe I should just always think of myself as a 'missionary' so I'll be more apt to share States side. I forgot about that so I'm glad you mentioned it! Yes, you do have to be really careful with what you say. I know even in Burma I am going to have to be more careful with what I write and post on-line. Thanks! Don't feel bad. I think they get passed by because they aren't the ones speaking and in center spotlight. This is so neat! I never knew you could buy forever international stamps! I'll have to get some of those!